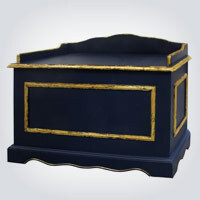 While driving home from gymnastics with my six year old son he reminded me of my promise of a toy chest for his room. We’d gone looking once or twice but the prices were astronomical for a little box made of pressboard so I wasn’t exactly in a rush to pick one up. With finances being somewhat tight (and unlikely to change anytime soon in our four children family) it certainly wasn’t a high priority. Just that minute I looked over to my right and noticed a bunch of items piled on someone’s front lawn. There was a “FREE” sign hanging from a chair on the pile. Curiosity got the best of me so I pulled over to see what hidden treasures might have been discarded. My son and I jumped out of the car to take a closer look. Low and behold, buried under a couple of boxes filled with books, was an old and slightly stained wooden toy chest. It had a lot of character and doubled as a wooden bench with carved side rails. It was the coolest thing I’d seen in some time. Besides, it was free! When my son saw it (he was right on my tail- like most children, junk piles hold endless fascination for him) he had a smile from ear to ear and he yelled, “Yay, we’ve got a new project!” Obviously this wasn’t the first time I’d brought stuff home for us to work on. He pulled open the lid and we saw that the chest was filled with old board games- just icing on the cake. And as I was trying to wedge the very heavy chest into my trunk I realized that it was made of solid mahogany- jackpot! Once we got it home, my son and I wiped it clean and I noticed that the wood was in great condition. All it really needed was a good sanding and a few layers of shellac. The following Sunday my kids and I tackled this project and were very pleased with the results. We had a great quality product, saved money, got to use our tools, were able to bond, and helped the environment by recycling. If you haven’t yet tried it, don’t be afraid to pull over and check out the free/inexpensive goods on the side of the road or at garage sales. Pick up a project and let your creativity run wild. With an inexpensive or free item there isn’t the stress of messing things up—so they’re perfect to hone your skills. Remember, at the very least, you and your children will have fun!